This is just a quick guide for all the Mac users out there that are trying to build Maya plugins in C++. I learned a lot about CMake and compiling for maya from Chad Vernon's series, if you have a bit of time on your hands, I definitely recommend going through this as it will be very detailed. 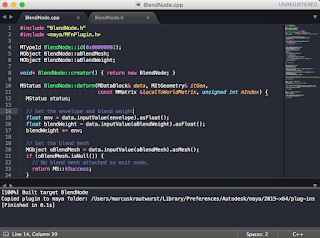 For this example I also used Chad Vernon's BlendNode that he was so nice to share. What we want to end up with basically being able to press Ctrl+B in Sublime Text and having the plugin built and copied into the maya folder so all we have to do is fire it up in maya. The first thing is to install cmake. Once you have done that, you need to create a good file structure. 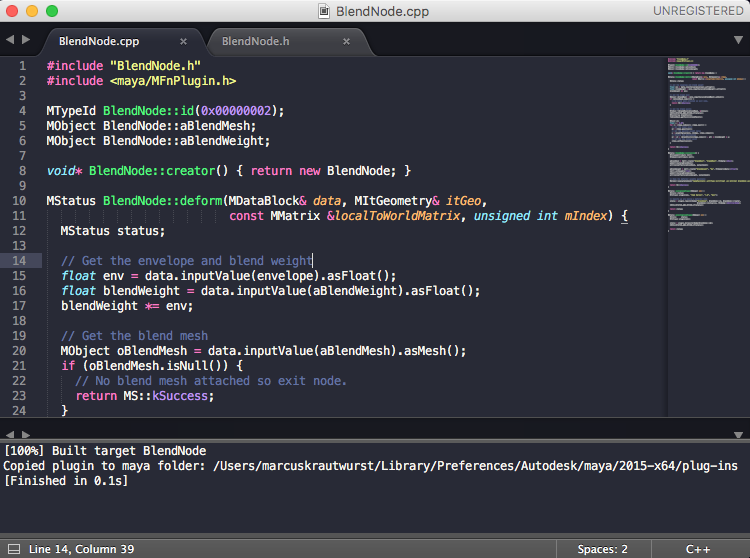 Download the FindMaya.cmake file and place it in the right folder. Next up we place the .cpp and .h in the src subdirectory. Once we have that in place, lets create the CMakeLists.txt.